The VPN marketplace is crowded with many players, all clamoring for attention as being the fastest or the most secure VPN service. NordVPN, a Panama-registered VPN service provider, claims to have the most advanced security features in the industry. The rest of this article evaluates NordVPN on how it protects your online anonymity and privacy. The primary reason for subscribing to a VPN service is to protect one's online security. Hackers, government agencies, and advertising companies are all interested in knowing details of your Internet activities, albeit for different reasons. 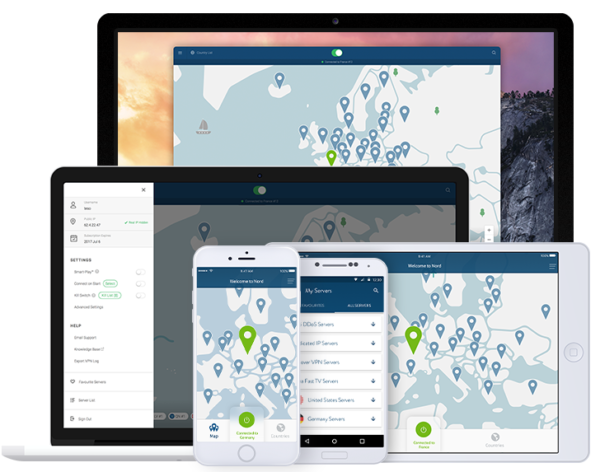 NordVPN operates a network of 3500+ VPN servers spanning 61 countries. When you connect to a VPN server, you establish a secure channel to the Internet because all traffic is encrypted. If you are looking for even better protection, you should consider the Double VPN feature. This feature is something unique that NordVPN offers in the industry. A Double VPN reroutes your Internet traffic to two successive VPN servers located in different countries. The advantage is that your data is encrypted twice, making it that much harder for hackers to decipher. Note that not all NordVPN servers support the Double VPN feature. You can choose 1 of 7 server combinations, e.g., USA-Canada, Taiwan-Hong Kong, and Netherlands-United Kingdom. A Double VPN, however, can be a double-edged sword. In general, encryption is a CPU-intensive activity, resulting in a speed performance penalty. Double the VPN, double the speed penalty. To properly evaluate this feature, empirical tests are necessary to see if you can tolerate the decrease in speed performance. NordVPN offers a 3-day free trial, and you should take advantage of it. To subscribe to the free trial, you need to contact NordVPN support. Tor is another tool in the toolbox for the fight against privacy violation. Tor is free, and it is effective. Basically, you download a Tor-enabled web browser. When you surf the Internet using that browser, your traffic is rerouted via at least 3 hops in the Tor network before it reaches the final intended destination. The Tor server at each hop encrypts the data that it receives before passing it on. So, traversing 3 hops results in your Internet traffic being encrypted 3 times. A best security practice is to use both Tor and VPN at the same time. Essentially, you are creating a fail-safe system: if there is a breakdown in one defence mechanism, you are still protected by the other. This is analogous to installing multiple locks to secure a door. NordVPN offers a special feature named Tor over VPN. The big benefit is that you don't need to download a Tor-enabled browser. You simply surf the Internet using your regular browser. NordVPN automatically forwards your Internet traffic from its VPN network to the Tor network. The caveat is that there will be a bigger performance hit because encryption is now performed in both systems. Tor over VPN is currently only available on 2 VPN servers which are located in Latvia and Sweden. If you reside outside those 2 countries, beware that speed performance will take another hit. The further you are from those locations, the bigger the performance hit. In general, your ISP does not champion the protection of your Internet privacy and anonymity. In many cases, it is your nemesis. ISPs have the means to track subscribers' Internet activities - what web pages they visit and when. Depending on the country they operate in, ISPs may be required by law to log those activities. Even if they are not required, they may do so for their own commercial interest. In particular, file-sharing BitTorrent users are at high risk. ISPs generally disapprove of your BitTorrent usage because of the bandwidth it consumes and the potential for copyright infringement. Some ISPs may even try to curtail your file-sharing activities by throttling all BitTorrent traffic. Not all VPN vendors support BitTorrent. NordVPN does support BitTorrent, albeit only on a subset of its VPN servers. Specifically, BitTorrent is supported on 404 NordVPN servers located in 19 countries. After you connect to a BitTorrent-supporting VPN server, you can securely run a BitTorrent client for file-sharing purposes. In this way, your ISP cannot throttle your file-sharing bandwidth because it does not know what you do inside the encrypted VPN channel. If you live in close proximity to a BitTorrent-supporting server located in the 19 countries, speed is not a concern. However, if you live far, you should test out the speed performance before committing to a paid NordVPN subscription. Note that if you run a BitTorrent client app while connected to a VPN server that does not support BitTorrent, you will be automatically rerouted to a BitTorrent-supporting server based in Canada. Despite being one of the largest VPN markets, few VPN vendors are incorporated in the USA. VPN vendors usually register their companies in countries with favorable privacy protection legislation. NordVPN, as noted earlier, is registered in Panama. According to the NordVPN website, the Panama government does not require them to keep any log of customer Internet activities. This is a significant advantage over competitors that are registered in countries that require them to keep such log. After all, if no log is kept, there is no data to hand over in the event of a government subpoena. When you are on the road, you may need to connect to the Internet using a public WiFi hotspot. Without a VPN, you are exposed to great privacy risk because the transmission is often unencrypted, and your data is therefore in plain sight for hackers. 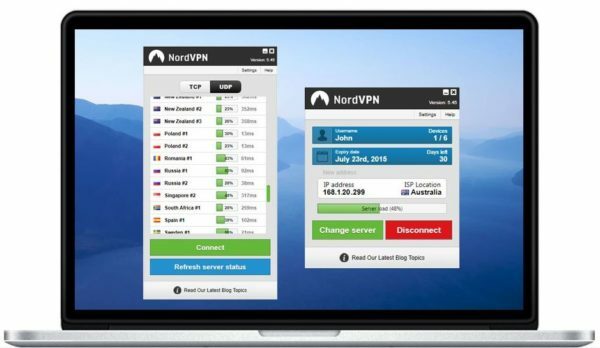 NordVPN provides VPN client apps that you can download to your Android or iOS mobile devices such as smartphones and tablets. Running these apps automatically configure and start up the VPN connection. This is a significant advantage over VPN vendors which require you to manually configure the VPN service. In general, all VPN vendors allow unlimited download of their client apps to Internet devices. However, they differ in how many devices can connect to the VPN simultaneously. This is an important criterion for choosing a VPN vendor because most users have multiple Internet devices, e.g., you may have a smartphone, a laptop, a tablet, a set-top box, etc. Most VPN vendors limit you to 3 devices connecting at once. In contrast, NordVPN allows 6 devices, the highest number you can expect in the industry. NordVPN offers several subscription plans with prices ranging from $3.99 to $11.95 (USD) per month. The $3.99 plan requires you to commit for 24 months. You can pay using a major credit card, PayPal, or Bitcoin. Accepting Bitcoin is a major step for improving total subscriber anonymity. Subscribers can purchase Bitcoin anonymously, and then use it to pay for the NordVPN service. Those who invested early in Bitcoin get the VPN Service now for an awesome cheap price. NordVPN subscribers are protected by a 30-day money-back guarantee. This is a big plus for NordVPN because many of its competitors only offer a 14-day money-back guarantee. Another plus for NordVPN is that it provides 7x24 email support. If you are interested in self-help instead, you will find a great deal of helpful information on the NordVPN website, including a FAQ, a blog, many tutorials, and a knowledge base. In addition, you can give feedback to NordVPN by using its community board. For example, you can suggest new features, volunteer for product beta testing, and fill out surveys. People subscribe to a VPN for different reasons. If you are uber paranoid about Internet privacy and anonymity, you should definitely try NordVPN because of its advanced security features. If your primary interest is to unblock regional web contents, then you should consider subscribing to a smart DNS service instead: it runs faster and costs about 50% less than a VPN. Update: NordVPN now also has SmartDNS included. This feature called SmartPlay is for unblocking over 150 streaming services in order to bypass their geo-restrictions. Below summarizes the pros and cons for subscribing to NordVPN. Simultaneous connection of up to 6 Internet devices. Advanced features are not supported on every server. free trial is for 3 days only.